Genesis Sonic 3 & Knuckles in 49:31.67 by SprintGod. Ultra fast bouncing around. 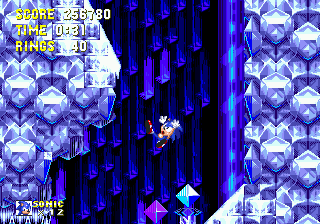 Completed without collecting any emeralds, with Sonic alone. The use of Sonic's different shields makes for some very interesting acrobatics. We recommend reading the author comments of this movie. This movie probably has the highest rerecord count (118,631) of all the movies of this site at the time of writing. Most of it was recorded at 6% speed, which at the time of publication was considered nearly frame by frame. All of the jumps appear to be extremely precise.